Summer edition out now featuring three outdoor spaces with lush and leafy inspiration. This issue, we invite you to explore four eye-catching abodes – from coastal farmhouse to leafy and contemporary, to modern oasis and light-drenched homes. Our front cover home, belonging to Kristy Gordon, has embraced greenery throughout her cheerful abode, and to stunning effect. The star of her all-white kitchen has to be that stunning glass splashback looking out to the vertical garden. 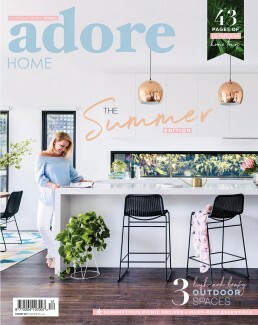 Adore Home Magazine is an Australian-based interiors magazine celebrating beautiful, colourful, modern homes and spaces. Once an online-only magazine, Adore Home is now a printed publication, released once every three months. Available in newsagents and boutique stores across Australia. Our website aims to deliver weekly doses of inspiration including home tours, and interior news and inspiration on our blog.